We’d love your help. Let us know what’s wrong with this preview of The Membership Economy by Robbie Kellman Baxter. If you’ve ever used ZipCar, Amazon Prime, Spotify, NetFlix, Groupon, Weight Watchers, SurveyMonkey, United Mileage Plus, Pinterest, Twitter – you are part of The Membership Economy, an increasingly popular model that author Robbie Kellman Baxter sees as the inevitable result of technological advancements, social trends, and a generation in transition. The membership-based business is a problem-solver for both businesses and individuals. It spares people from the duties of ownership, and provides a feeling of commonality and affiliation. For businesses, it offers the opportunity to create a “forever customer” who remains loyal and participatory, even as the company shifts and changes. Membership allows for building direct relationships, and continuously generates a data stream that can be tapped for a variety of purposes. To ask other readers questions about The Membership Economy, please sign up. This book is an important read to anyone who has customers. The key to getting more business from repeat customers is to STOP treating them like customers and START treating them like members. The Membership Economy is not a book about some esoteric trend in Silicon Valley. It's a practical manual for how any organization can shift from being customer-centric to being member-centric. Anyone who treats their customers like ongoing members and delivers benefits to those members on an ongoing basis This book is an important read to anyone who has customers. The key to getting more business from repeat customers is to STOP treating them like customers and START treating them like members. 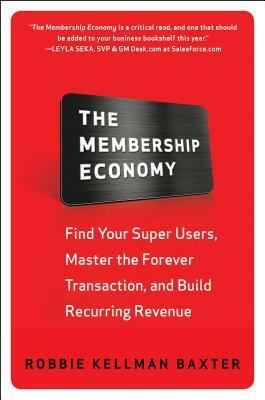 The Membership Economy is not a book about some esoteric trend in Silicon Valley. It's a practical manual for how any organization can shift from being customer-centric to being member-centric. Anyone who treats their customers like ongoing members and delivers benefits to those members on an ongoing basis (and continually innovates around membership benefits) is sure to win. Let’s look at the book. The Membership Economy is in three sections. With all the success occurring with subscription boxes, Car share programs and being a member of the Hootsuite Ambassador team, I was expecting more from The Membership Economy by Robbie Kellman Baxter. Do you have customers - transient or regular - or do you have members, people who feel they have a connection to your business and the products or services that you offer? The so-called “Membership Economy” is a fairly modern constructive term, yet it hardly seems so new. Technology has just made it perhaps more prevalent, more accessible and more in-your-face. Maybe you’re a member and haven’t realised it? The distinction can be lost, especially in the digital world. You can be a customer of Ama Do you have customers - transient or regular - or do you have members, people who feel they have a connection to your business and the products or services that you offer? The so-called “Membership Economy” is a fairly modern constructive term, yet it hardly seems so new. Technology has just made it perhaps more prevalent, more accessible and more in-your-face. Maybe you’re a member and haven’t realised it? The distinction can be lost, especially in the digital world. You can be a customer of Amazon (and member of its online service) but you are a member of Amazon Prime. Yet the concept can be more than just a subscription. Maybe it depends on what you are a member of and how you utilise your membership? A book such as this promises to explain the mystery which is, the author contends, the inevitable result of technological advancements, social trends, and a generation in transition. The author argues that we are willingly moving away from the concept of ownership yet we still want the benefits of access, a feeling of ownership or community. There is pushback too and even a renaissance in owning physical things. Who knows what will win. Human nature shows we are prone to collecting things… Yet to a company, if you have the right product and service the concept of transitioning your customers to being members, a source of regular income and ever-closer relationships is an attractive concept. It can require more work than you might imagine and the customer can be fickle, loyal for a time and then quick to switch their affections to another suitor as required. All the buzzwords can be brought under one roof. It is up to you to make something out of it all! There is more to building a “sticky relationship” than just acting as a glorified shop selling dubious member benefits and posting an questionably engaging, one-sided stream of curated content via social media. Customers, or members, are not necessarily as dumb as many assume. The author presents an interesting, pragmatic and provoking look at what is undoubtedly a topic that is gathering traction. Are we as a society as connected as we want to be? We arguably are cutting other ties, becoming often more insular and yet we crave social acceptance and connection through social media. It can seem curious that we shun one form of connectivity in favour of a less concrete, more virtual form. The author disagrees, noting that this is not true. Of course simple subscription benefits can exist but a lot of the value of membership can come through shared data and community feedback, such as how Netflix analyses its members' behaviour to provide recommendations of other films. Some members enthusiastically use and embrace the membership benefits. Others just consume the product. There is a lot more of this straightforward thinking and analysis. The book manages to provide a fresh perspective on a developing subject. It might be a good strategic read for you and for your company! I love Robbie Kellman Baxter's new book. The content is outstanding and exceptionally relevant. Ever wonder why there are multitudes of Silicon Valley start-ups that are using membership and community in their core business models? This book not only explains why, it shows you how. For those of us in the membership economy this book is a milestone, codifying the framework and designating the era in business terms that are easy to understand, grasp, and implement. I am the founder of AssociationTr I love Robbie Kellman Baxter's new book. The content is outstanding and exceptionally relevant. Ever wonder why there are multitudes of Silicon Valley start-ups that are using membership and community in their core business models? This book not only explains why, it shows you how. For those of us in the membership economy this book is a milestone, codifying the framework and designating the era in business terms that are easy to understand, grasp, and implement. I am the founder of AssociationTransformation.com - a community of membership CEOs focused on innovation. Robbie and her book have found enormous resonance within my community, bringing together the leaders of some of America's largest and most esteemed associations to take advantage of the knowledge, experience, expertise and know-how Baxter has captured in this important book. A well-researched look at how membership organizations have succeeded, and how to replicate that success. There are plenty of examples, and good summaries make it easy to digest. It's clear that Baxter has a lot of experience working with membership organizations. I felt I needed to work too hard to glean the lessons from the fairly long examples; they could've been distilled to save the reader time. Baxter defines membership as being formally engaged with an organization or group on an ongoing b A well-researched look at how membership organizations have succeeded, and how to replicate that success. There are plenty of examples, and good summaries make it easy to digest. It's clear that Baxter has a lot of experience working with membership organizations. I felt I needed to work too hard to glean the lessons from the fairly long examples; they could've been distilled to save the reader time. Baxter defines membership as being formally engaged with an organization or group on an ongoing basis. In a membership, the organization builds relationships with members. Memberships may involve subscriptions, community, and communication, but those things alone don't make a membership. I read this because I'm overhauling the WordPress website care plans (maintenance plans) offered by my web agency, OptimWise, and I'm learning about improving subscription services. I much preferred The Automatic Customer to this book, but maybe that's because that book is specifically about building a subscription business, and this one has the broader scope of membership organizations. A subscription is a financial arrangement; a membership is a sense of belonging to a community, and having the organization tailor its offerings to your preferences. 1. Creates recurring revenue and removes lumpiness. 2. Builds a more direct relationship that strengthens the brand, by putting customer at center. 3. Generates data that can be used to improve services. Ideally, members engage with each other so all benefit from the thoughts, experiences, opinions of others. Replace customer support with customer success. Empower frontline staff to take good care of members. Be more consultative to build loyalty. Be personal, build relationships. Goal is to maximize loyalty, not just minimize anger. • Welcome: make sure they know what they signed up for. Thank them for joining. • Engage immediately. Provide initial value. Use gamification to encourage behaviors. Connect with other community members. • Ask for feedback. Contact within first week. • Give feedback. Tell how they compare to other members. Point out new customer's unique strengths. • Ask for referrals. Encourage to invite friends in the first 30 days. • Transition to nurturing. Give info to help optimize experience and connect. Communicate consistently. Most organizations have 3 pricing options, based on research that most people prefer to have options, and majority choose middle option. Annual payment is best for many organizations because it locks in longer terms, but this changes customer's decision from impulse or low consideration to thoughtful, considered decision. Once they rethink purchase, they may cancel. Offer a la carte services, but don't put out-of-the-ordinary one-time services into a higher-level ongoing tier, because customers may feel cheated for being forced into an ongoing commitment for a one-time need, or may game the system by upgrading for just one month. When raising prices, grandfather current members, to avoid backlash and build stickiness. Add higher tiers with more benefits. If you must raise prices on current members, be transparent. You can also add and remove a la carte services. Nearly every company benefits from offering options and different levels for different segments of members. Build options based on the objectives of segments. Discounting should only be done to get people to try product long enough to commit to a full price, or if alternative is losing customer. Don't offer a free trial that doesn't to provide the full experience. This gives an inaccurate and negative impression. If you fear customer will fill their need with free trial and not pay for full, create a short-term paid membership option. Don't offer premium option when there's no interaction between users (such as accounting or security apps) since there's no potential for viral marketing or network effects. When members help others get up to speed, they become more loyal themselves (e.g., user groups). • Periodically give something extra. • Allow them to connect to you personally. • Incorporate incremental setup to make switching cost seem high. • Connect members to each other, to help each other. • Invite members to create content for community. • Use newsletters and messages to tell members how to get more value. • Ask members for ideas and advice. Members are more reluctant to cancel when they achieve status, have customized experience, build relationships, or have a grandfathered benefits or discounts. Cancellation must be easy and clear, or they will complain to you and anyone who will listen. Also, people are more likely to sign up again if it's easy to cancel. Let canceling members have a free subscription of some kind - something that lets them remain part of the family. When it decided to raise prices, SurveyMonkey kept annual subscription the same price ($200) but raised monthly price by 20%, motivating best customers to switch to annual. It also added 2 higher-priced tiers at $300 and $800. Some customers upgraded, but majority of high tier users were new. SaaS companies can share data (collected by systems or surveys) with customers, or offer advice on making better decisions in certain verticals. Try to keep subscriptions at same price. Difficult to raise a subscription price without adding benefits. Many subscription organizations have found annual payments have a net positive effect on retention and revenues. The membership approach is huge and both very new--disrupting industry after industry--and very old (think churches and guilds). If you aren't looking at this approach, probably one of your competitors is. And membership doesn't do well as a bolted on extra option. To work, the entire organization needs to be focused on real community and the members. Very important topic. But I give four not five stars because this book is written like a textbook. It's wordy and dry and has a silly glossary and The membership approach is huge and both very new--disrupting industry after industry--and very old (think churches and guilds). I am not a membership economy kind of guy. I hate feeling pushed into communities and memberships. Years ago when my grocery store adopted customer loyalty cards I immediately switched to a different store, when that one also adopted them I switched again, now the third store has also finally adopted customer loyalty cards as well and I’m trapped. I’m old enough to remember when you could get items that were on sale at the sale price without needing some stupid card. I drives me nuts that I have I am not a membership economy kind of guy. I hate feeling pushed into communities and memberships. Years ago when my grocery store adopted customer loyalty cards I immediately switched to a different store, when that one also adopted them I switched again, now the third store has also finally adopted customer loyalty cards as well and I’m trapped. I’m old enough to remember when you could get items that were on sale at the sale price without needing some stupid card. I drives me nuts that I have to give Safeway my phone number just so I can save 37 cents on my bag of Doritos. But these customer loyalty programs, which frequently feel so crudely manipulative, actually work, because people are idiots with an inborn herd mentality. In The Membership Economy, Robbie Baxter explains how you can exploit this herd mentality to milk cash from your customers. Ok. I can see I’m being too harsh. The whole concept of the membership economy goes against my grain (with the exception of business where a membership model makes perfect sense, like Costco, Netflix, or Amazon Prime). I want as little contact with the company selling me something as possible (unless I have a problem. In that case, please talk to me). I’m just not the target for the membership economy, and Baxter admits that not everyone is. But for many people, apparently, feeling like you are part of something larger, feeling you belong in some way, is essential to their customer satisfaction when they purchase a carton of Tide Pods. To implement this system could be a challenge, especially for companies that already hav Recurring revenue is part of THE MEMBERSHIP ECONOMY, a dreamy business model for entrepreneurs that doesn’t work unless it creates a sense of community through generating value for customers and consequently, loyalty. In her book Baxter provides an online business roadmap that is packed with step-by-step digital strategies, useful resources, and case studies of super successful dot-com companies. The goal of the book is to show you how to get the most revenue from your online product, create an engaged community of customers, place your revenue on autopilot, and create sustainable loyalty programs. The book is written so that you may jump in and out where needed. For your convenience, we had Robbie Baxter on o In her book Baxter provides an online business roadmap that is packed with step-by-step digital strategies, useful resources, and case studies of super successful dot-com companies. The goal of the book is to show you how to get the most revenue from your online product, create an engaged community of customers, place your revenue on autopilot, and create sustainable loyalty programs. The book is written so that you may jump in and out where needed. A very thorough book about membership services and businesses. I learned a lot while reading it that is useful to me both as a consumer and as a potential membership business sales rep.
Memberships have been around forever and give people a sense of belonging and comfort. With advanced technology the membership concepts has changed. It is becoming more of a contract relationship. Opportunities are opening up daily! I would have preferred to read this book and discussed with members of my business te A very thorough book about membership services and businesses. I would have preferred to read this book and discussed with members of my business team. It is a lot to absorb alone. Because of that I will be referring back to it and rereading in smaller sections. I'm a startup founder and one of the many in search of the 'forever transaction'. This book lays out the fundamental principles of creating a community where your current and potential customers feel like they belong and develop loyalty to your brand. One of my favorite aspects of the Membership Economy is that it doesn't just prescribe a 5-step checklist that will work for every business. Instead, the book gives several different examples and applications to try. Bottom line: Insightful and time I'm a startup founder and one of the many in search of the 'forever transaction'. This book lays out the fundamental principles of creating a community where your current and potential customers feel like they belong and develop loyalty to your brand. Really enjoyed his great book on the value of membership and how to truly drive value from members, rather than being focused on the process of extracting revenue from customers. The key factor for me was finding your super users and developing your community. Also, the focus on the members you have today and providing them the platform to grow your community. To stay competitive in a membership-oriented business world, you need more than a basic company homepage; your whole organization needs to be built around the concept! If you fully commit to a membership model, put the right strategy in place to gain and retain members, appropriately price your product and track user behavior, your business will prosper. Honestly, there is nothing new here. This book is about 5 years too late. It might be of value for someone who doesn't spend a bunch of time thinking about, and working in, tech space, or a person who is completely uninformed about how companies like Netflix have built their businesses. The content wasn't poorly written, it was just unoriginal and untimely. Wondeful book - as someone running an online subscription business, she hit the nail right on the head. I made so many notes, and have been executing a lot of the ideas she raised already. Top book if you're in the field. Loved this book. It is easy to read, informative, and contains many examples and case studies. Interesting, probably more applicable to for-profit companies than a public library. But the author has great information and points to ponder for anyone running an organization. Robbie came to speak to the Office team in January. She challenged us to find creative ways to build a sense of community and membership among our Office users. This book is going to require a second read, as it was extremely in-depth. As opposed to "The Automatic Customer" and "Subscription Marketing," "The Membership Economy" digs deeper on the nuts and bolts of creating membership and paid subscription products — including more complex areas like billing, retention and churn. These are areas which the other books I've read touch on, but don't dive into very deeply. Required reading for anyone looking to build a membership platform! Too superficial. She describes the new paradigms of the membership economy, but the advices are extremely general and supercial. Talk to your customers, plan you growth, look for retention. Not much enrichment from this book. This book address and interesting subject one that various people will need to consider for how membership applies to their business. For a small business, I feel the book could have added some "how to" or "step by step" example that needs to be taken. After Reading this I am cancelling many of my subscriptions. Great book for people who work in membership driven organizations. It structures pretty well the different kinds of organizations, and also the different strategies and tactics that should be applied when creating a successful "membership economy" organization. Even though I lacked the deeper tips and tricks that made these particular membership companies successful. (Changes in User Interfaces or Subscrip I have like this book overall, because it touches a very important topic, which we see and experience every day in our digital world: the membership economy. Very good book on the membership business model. Author did a great job and was very thorough and detailed. He ended book with a great call to action. I recommend this book to any entrepreneur wanting to improve their business by converting one time sales to long term customer relationships. I did get a lot of ideas on how to incorporate this. Read this for work. Actually really interesting (for a business book). Not as informative as I had hoped.